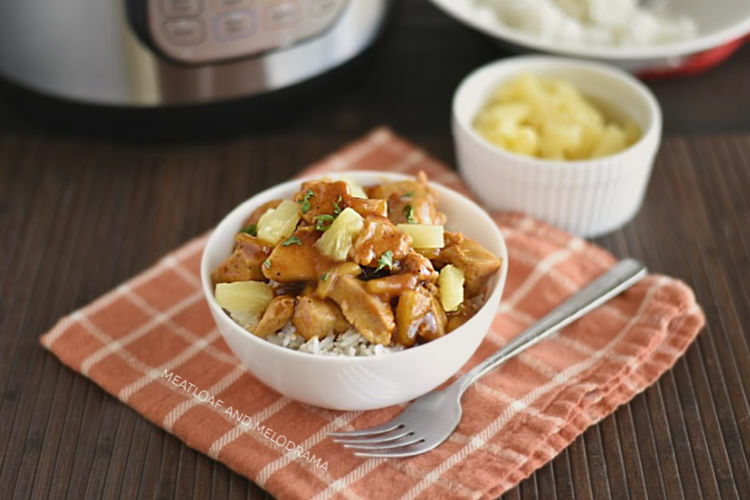 Instant Pot Hawaiian BBQ Chicken cooked a sweet and tangy sauce with pineapple is a quick and easy pressure cooker dinner made in just 30 minutes! 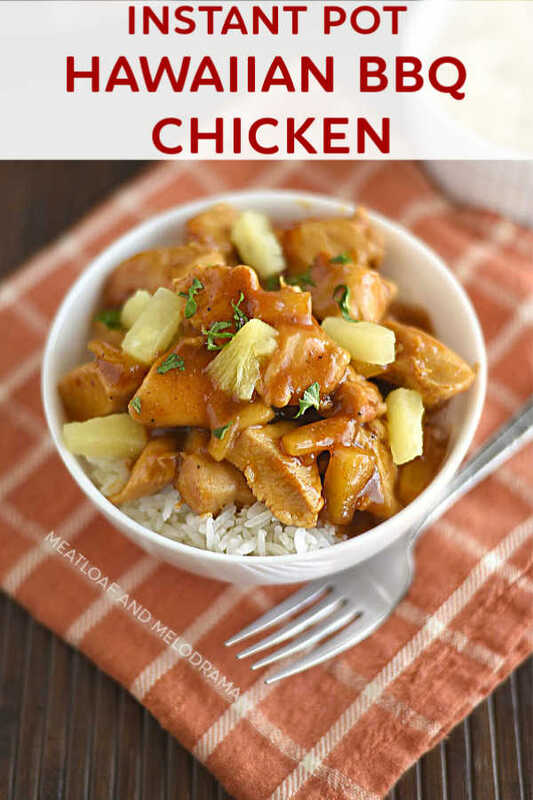 If you’re looking for a super quick and easy chicken dinner your whole family will love, this delicious Instant Pot Hawaiian BBQ chicken recipe is for you! 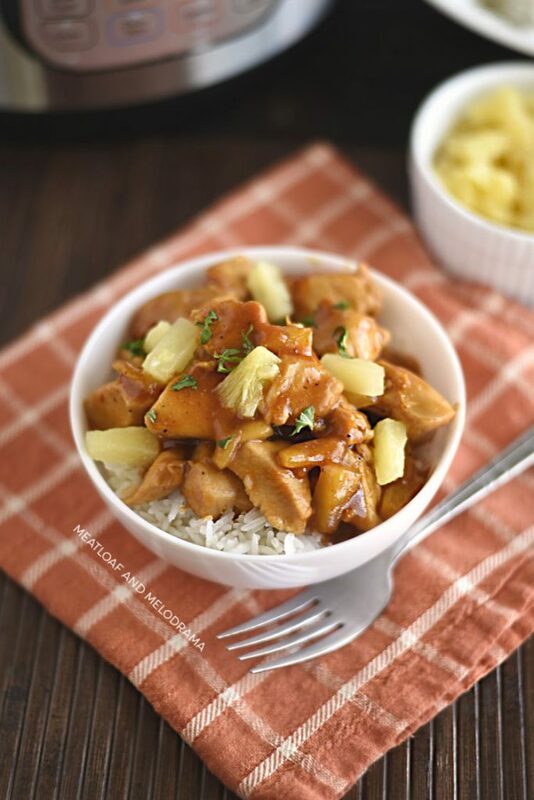 I made this easy pineapple chicken several times already this month, and it’s now one of my family’s favorite easy Instant Pot recipes! I’m always looking for new Instant Pot recipes with chicken since we have chicken for dinner several time a week. Sound familiar? This Hawaiian style chicken was inspired by my Instant Pot Hawaiian BBQ pork chops recipe. 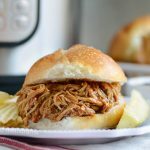 People comment that they love the sweet and tangy sauce, so I decided to make the same basic pressure cooker recipe with chicken instead of pork. You guys, this chicken dinner is definitely a winner! What is Hawaiian BBQ Chicken? It’s chicken (or pork) cooked in a sweet and savory sauce made with barbecue sauce, pineapple, brown sugar and spices. Some recipes use soy sauce — mine doesn’t, but you can add some for more umami flavor. This isn’t the most authentic Hawaiian chicken recipe, but we love it! Cut boneless skinless chicken breasts into approximately 1-inch cubes. Then, add them to the pressure cooker, along with the seasonings, and cook on saute mode. Cook only until no longer pink — the chicken will finish cooking under pressure. Next, add pineapple tidbits and juice. Then, add the brown sugar and BBQ sauce over the chicken, but DON’T STIR! Sorry for the caps, but thick sauces like barbecue may trigger the burn notice if you stir everything together. This way, the sauce goes on top, and the thinner liquid will allow the pot to reach pressure without problems. Say that last part 5 times, friends! After pressure cooking the chicken, give it a good stir. Then turn on the SAUTE setting, mix a cornstarch slurry using a mix of cornstarch and pineapple juice or water, and stir it into the bubbling sauce. 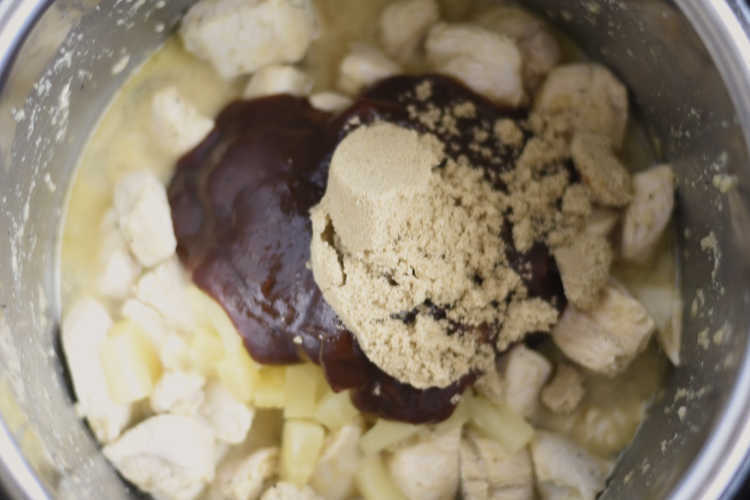 You can skip this for a thinner sauce, but the slurry helps thicken it up and gives it a smooth, velvety texture. We love spooning this Instant Pot chicken over Instant Pot jasmine rice! And the kids like adding more pineapple tidbits or chunks over the chicken. You can also serve it with a side of peas, corn or salad greens. It’s so simple, but so good! 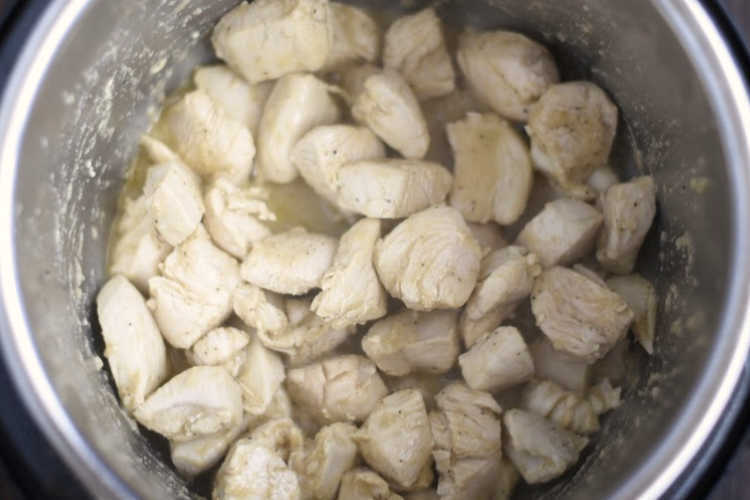 Best of all, this Instant Pot chicken recipe is ready in 30 minutes or less. Perfect for busy days! Contains affiliate links. See disclosure page for more information. 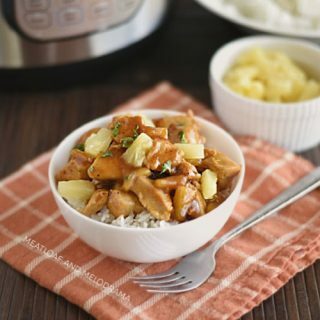 Instant Pot Hawaiian BBQ Chicken cooked a sweet and tangy sauce with pineapple is a quick and easy pressure cooker dinner made in just 30 minutes! Even picky eaters love it! When pin drops, carefully remove lid, and stir. Hit CANCEl, then hit SAUTE again. In a small bowl, mix the cornstarch and pineapple juice or water, then stir it into the sauce and allow to cook until sauce thickens. Recipe was made in a 6 quart Instant Pot electric pressure cooker. For an 8 quart, use 1 cup pineapple juice. Cook time remains the same. 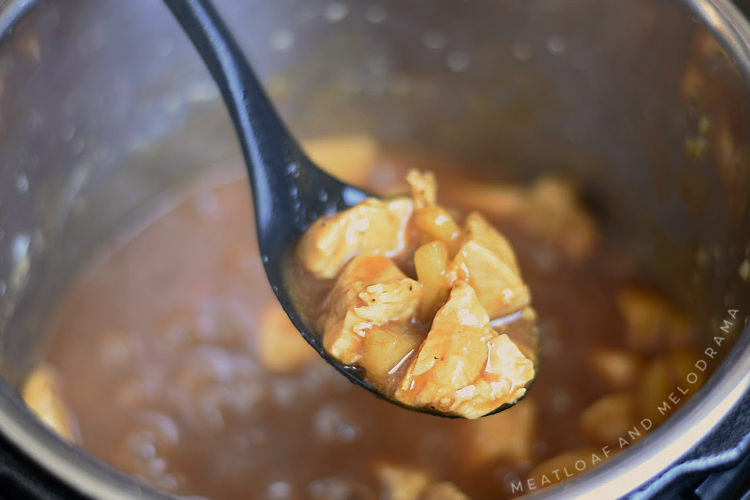 I hope you enjoy this easy Instant Pot Hawaiian BBQ Chicken as much as we do! Definitely making the menu this week! So glad that you liked it, Kate! Thanks! My family would LOVE this! It looks and sounds SO delicious! My family practically inhaled this! Thanks, Katerina! This chicken looks fabulous! I want this for dinner tonight! I’m making this tonight for the kids…they will love this sweet sauce and I love how easy it is to make! Had this last night. Easy and awesome! The kids want it again before the week is over! You made my day, James! Thanks so much! 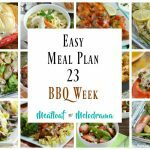 I have to add this to my menu this week! Looks great! Thanks, Krista! Hope you enjoy it as much as we do! I made this last night and had enough for leftovers today! My husband actually at the leftovers because he loved it so much. Sounds like my husband! Thanks so much, Jackie! I need to try this immediately, it looks so good! I have to put this on my menu!